Create groups in the web app. 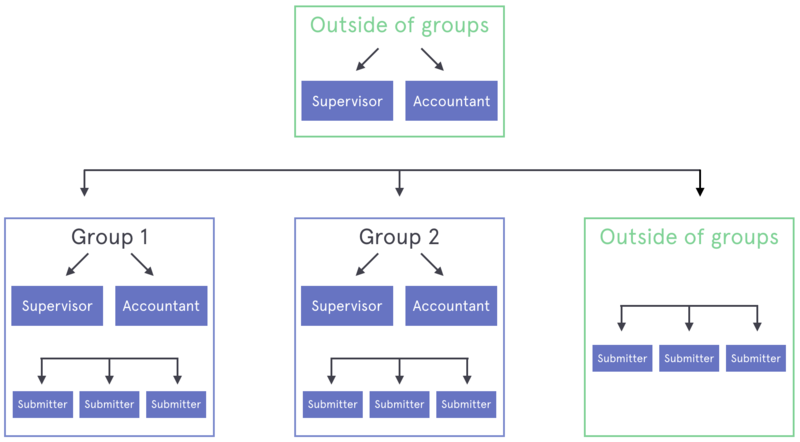 Assign users to groups and define their roles. This article describes how admin users can manage user groups in the Circula web app. Groups allow you to create approval and controlling flows within specific company units. You can assign specific supervisors and accountants to specific submitters, thereby allowing for greater control of responsibilities within your company, which leads to a more efficient management processes. You can furthermore add accounting-relevant information to the groups. What does “Users Outside Groups” mean? In the Supervisors & Accountants tab you can choose which users should have supervisor and/or accountant privileges for the whole company. Additionally, in the Submitters tab, you can view submitters that have not been assigned to any specific group yet. The expenses of unassigned submitters will appear in the To-Dos of company-wide supervisors and/or accountants. How do I add a new group? As an admin, you can create new groups by navigating to the Groups tab in the User Management section. To read more about different user roles, click here. Select the supervisor(s) and accountant(s) that will be in charge of approving and controlling expenses. Add submitters whose expenses will be reviewed by supervisors and accountants. You can choose a default cost center for this group from the list of active cost centers that you will see when opening the drop down component. All expenses submitted by a user of this group will receive this specific default cost center. Cost centers can be created here.